Recently, devs from MANTA and techs from Solidatus have joined forces to bring data owners and analysts a powerful visualization and management tool for data lineage supported by an advanced automatic discovery application. Read on to find out more about our new friends and what this bond has to offer. Since its launch at the beginning of 2017, Solidatus has won long-term contracts with major global Financial, Pharma, and Utility companies. Solidatus is a powerful data lineage discovery and visualization tool that complements existing solutions such as Collibra, Informatica, IBM, Excel, and many others. With its easy to use, intuitive, and highly scalable web interface it sources and combines all the lineage information in one place. 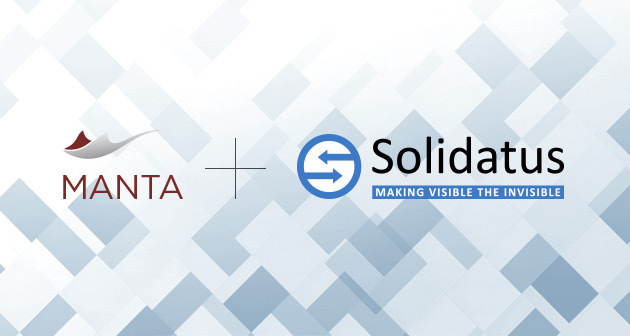 In partnering with MANTA, Solidatus will build on its proven success creating data models across end-to-end business flows by integrating with MANTA’s database scanning and cataloging technology. This will enhance the discovery and management of complex flows hidden deep in databases, scripts, stored procedures, and other kinds of data processing logic. Learn more about Solidatus on their website or just ask for our joint solution on manta@getmanta.com.